For the first time in this campaign, Save the Delta Queen legislation will come before the full House of Representatives -- but only if we act immediately. During the week of February 25-29, the Coast Guard reauthorization bill is scheduled for a vote by the full House of Representatives. Congressman Steve Chabot has drafted an amendment to the bill that will continue the Delta Queen's exemption from the 1966 Safety at Sea Act. But that amendment must first be okayed by the House Rules Committee. Most likely, Rep. James Oberstar will pressure the Committee members to disallow the amendment. The Rules Committee members are listed below. If one of the members represents your House District -- or even if you live in the same state -- urge him or her to vote in favor of Rep. Chabot's amendment to the Coast Guard Reauthorization Bill. Ask everyone you know who lives in one of these states to do the same. You can reach all of these members in their District offices the week of February 18-22. They will be back in Washington on the 25th. 1214 Longworth House Office Bldg. 1514 Longworth House Office Bldg. State Representative Rocky Adkins has introduced a pro-Delta Queen resolution (HR 109) in the Kentucky House of Representatives. Mr. Adkins is the House Majority Leader. It has been passed to the House Transportation Committee. Please contact your state representative and ask him or her to support HR 109. The Delta Queen's fate could be decided during the week of February 25-29, 2008, when the Coast Guard reauthorization bill is scheduled for consideration by the full House of Representatives. Congressman Steve Chabot will introduce an amendment to the bill that, if allowed by the Rules Committee, will continue the Delta Queen's long-standing exemption from the 1966 Safety at Sea Act. Even if you have done so already, please contact your Representative NOW and urge him or her to vote for this bill. And ask everyone you know to do the same. You can either call or send emails or (better yet) faxes to Washington offices this week or to district offices next week, when members of Congress will be home for a Presidents' Day work period. 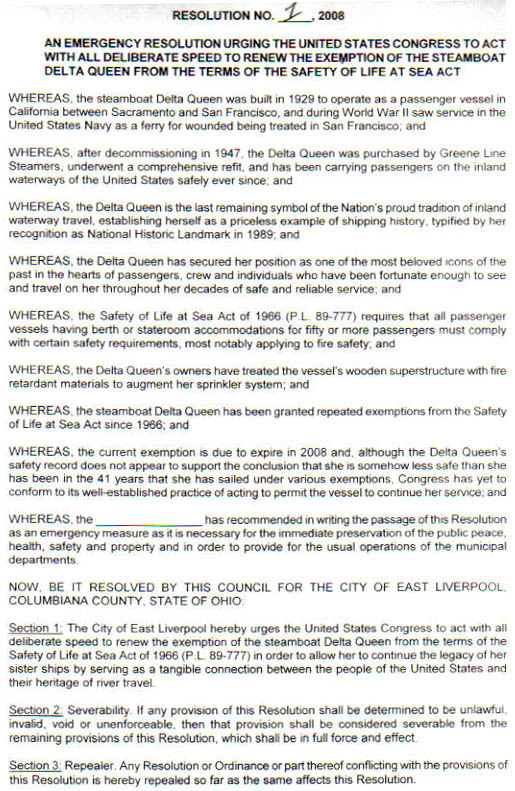 State Representative Robert Mecklenborg has introduced a pro-Delta Queen resolution in the Ohio State Legislature. It has been passed out of the State Government Committee and is awaiting a floor vote. Please contact your state rep and ask him or her to vote for HCR 36. H.R. 3852 (Rep. Steve Chabot's bill to exempt the Delta Queen from the Safety of Life at SeaAct) now has 24 co-sponsors. Rep. Robert Latta of Ohio signed up on January 29, and Rep. BartGordon of Tennessee joined the list on February 6. There are some inaccuracies in the article as it appears above [see original] and in newspapers today that I feel should be corrected. First of all, the superstructure of this boat is not entirely made of wood. Significant portions of the boat's structure are made of steel. The hull is double wall steel, the last hull added in the late 1980's, the front Texas bow deck, a major relaxation area for passengers during the day is supported with steel beams, the pilot house and the Texas Bar below it are supported with steel columns, the walls of the main deck are steel plate, and walls of spaces within the hull are made of steel. Second of all, lawmakers have not declined to extend the exemption due to the simple fact that the exemption has NOT been offered as an attachment to any bill. In other words, the continuance of the exemption has NEVER been voted on. It appears that there are two members of Congress, Rep. Oberstar from Minnesota and Sen. Inouye from Hawaii that have together declared that the Delta Queen is so totally unsafe that to bring up the exemption for Congressional discussion and vote is a waste of time, and they are blocking all attempts to add the exemption to any bill. Now the thing that got me and my wife thinking is neither gentleman have stated that they have cruised on the Delta Queen or even visited her, yet these two men are expert enough to declare her unsafe? And the representative from Minnesota, chairman of some sort of transportation committee, is more concerned about the safety of this boat than he is of his own state's interstate bridges? There are a lot of facts about the Delta Queen that should be discussed by all in Congress before the exemption expires. The law in question that the boat seeks exemption from is the Safety of Lives at Sea Act, a law passed in the 60's after the ship the Yarmouth Castle burned in the Atlantic with much loss of life. The law specifically is titled "at Sea" yet unfortunately also applies to the Delta Queen, a boat that will never be out to sea. The law was written to prevent overnight passenger boats to be made of flammable materials such as wood, as the difficulty of abandoning ship in the ocean and the difficulty of getting the passengers to the safety of land, is understandable when at sea. The Delta Queen does not have these issues as the boat is at worst minutes, and at best, seconds from land, the boat has a stage (picture a movable gangplank) allowing the people to walk off the boat to land, and best of all, most rivers that the Delta Queen travels on are so shallow that the boat is incapable of totally sinking. I think you'll agree that in an emergency a Delta Queen passenger can get off the boat to the safety of land a lot faster than a boat with life boats in the middle of the ocean. 1. all interior spaces are fully sprinklered. 2. the main deck at the bow, since it is the main exitway for passengers is fully sprinklered. 3.all interior spaces have heat and smoke detection equipment. 4. the boat has continuous watchmen service from 10pm to 6am every night. The watchmen must report to electronic sensors scattered throughout the boat, inside and out, on a timely basis, every 20 minutes. 5. the underside of all passenger outside decks , which would be the exitway if evacuating the boat, are sprayed with NASA developed fire retardent paint. 6. there are fire hoses on the outside decks, and I'm not sure of the exact count but I can see at least 7 in my mind. 7. there are approximately 40 large capacity hand held dry chemical fire extinguishers throughout the boat. 8. all superfluous flame producing items, such as Sterno to keep food warm, and candles are prohibited. 9. Smoking is only allowed outside and the ashtrays provided are "windproof". 10. The crew is trained to the satisfaction of the Coast Guard in the prevention, detection and suppression of fire. The crew and boat is inspected often throughout the year by the Coast Guard to verify that all issues are safe. The Delta Queen is the last of her kind. She is the original, in comparison to her bigger sister ships, the American Queen and the Mississippi Queen, she is the rarest of antiques while the others are reproductions, faint copies. She is on the National Historic Register, one of only two items in our country on that register that move under their own power. The other being San Francisco's cable cars. And I got to say it, the cable cars are also made of wood. The point is that if we are to lose the continued cruising of this legendary boat, the country will be that much poorer for it. My wife and I have cruised the Delta Queen 18 times in the past 7 seasons. Never have we felt unsafe, all we felt is like it was coming home... We can't wait to cruise on her again. The mechanical engineer in me, now retired I'm happy to add, asks that you correct your statements. In addition I ask that you help us in the fight to keep this Grand Old Lady of the River cruising. I will add a little food for thought on the safety of this boat: The night before our last Delta Queen cruise we slept in our wood framed, non-sprinklered, watchmen challenged, 2 smoke detector, no fire hose house, the next morning we drove 55 minutes in rush hour traffic to get to the airport, boarded and flew on an airplane, took a bus from the airport to the river in stop and go traffic, and that night we slept on the Delta Queen. Statistically speaking, which of these five tasks were my wife and I the safest, the least at risk? The exemption being voted on, or not voted on as the case may be, has nothing to do with safety, though that is the excuse that is being used. If it is so unsafe, are all past members of Congress and at least 6 Presidents now embarrassed that the exemption passed many times over a period of 40 years? No, this is strictly politics... the true reason is there is a very, VERY upset union that is getting even with a company that allowed their boat to go non-union in March 2007. She watches America's towns go by. Proud to be America's angel riverbound. She has been through good times and bad . . . that is our bond. The Delta Queen should cruise toward the sunset . . .
At noon on May 5, when the Delta Queen is in Cincinnati, our committee will hold a support rally at the National Steamboat Memorial. Congressman Steve Chabot and former Greene Line vice president Gordon Greene will deliver brief remarks, and singer/songwriter Dan Landau will perform his song "God Speed, Delta Queen." The event is still in the planning stages, and as we confirm the appearance of more speakers and performers, we will post the details here. Please encourage anyone you know who lives in or near Cincinnati to come out and join us! The respective chairmenof the transportation committees in the U.S. House and Senate have decided not to bring the DeltaQueen exemption to the floor. They say it is because the boat is unsafe, but the boat has alwaysbeen exempt from this law because it does not go to sea (as in Safety at SEA Law). The boat'slicense to operate proves it is safe. Still, because the current exemption expires in November,this could be the boat's last year of operation. If we could get Ambassador / Majestic, SIU, Coast Guard, House and Senate on the same page, then the boat would get the exemption for sure. That might involve bringing SIU workers back to the Delta Queen, American Queen, and Mississippi Queen, boats they were always on before 2006. The best thing we can do is tell our U.S. Representative and two U.S. Senators we care about the boat and want it to stay in operation. We also need to tell the media, so write to your editors, local TV stations, and tell them you want news about the Delta Queen situation.For more latest news click here. 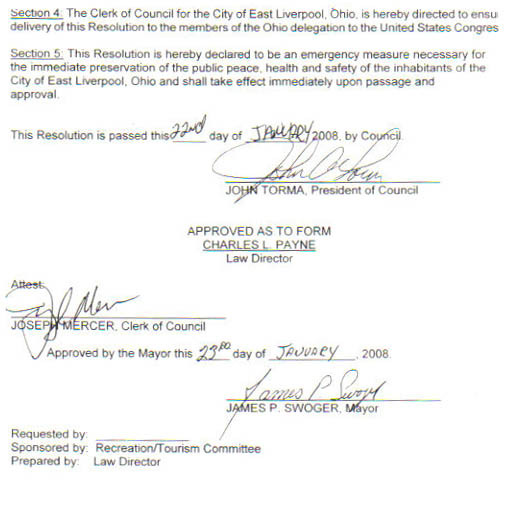 Resolution from East Liverpool (to find recommended resolution language, go tolast month's latest news page click here). Click here for latest questions / requests from the steamboat community.